How many years of work cover these photos? 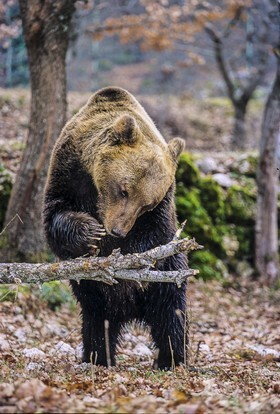 �This reportage is the result of 15 years� work, it start in 2001 and this year will lead to the publication of the book �the spirit of the wood� the first photographic book entirely dedicated to the Apennine Brown Bear�. Among the bear photos you sent us, the most recent dates from 2009. Have you been shooting them since then? �Since 2009 we have gone on working in the territory of the bear, focalising on the treats and problems related to bear conservation status, but we stop using camera trapping and hidden because this part of the project was over. 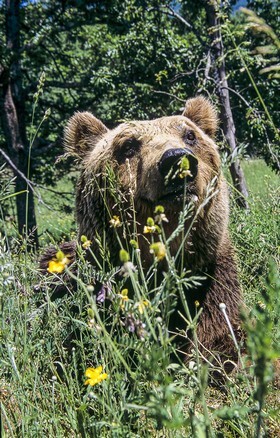 During our work we collaborated strictly with the researchers in charge for the conservation brown bear project and follow the protocol, to be sure to avoid any problem for the fragile animals still living in the wild�. Are they the result of camera traps only or do you sometimes operate hidden (under a canvas or a wooden shelter)? �We use moving canvas hidden self-made to minimize the space and maximize the camouflage so that we can, once again, reduce the disturb to the animals�. 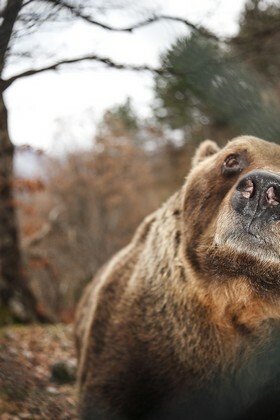 According to you, the Apennine bear is shy and reserved. Isn't it a problem for the photographer? What are the animal's other specificities? �It is very hard to take pictures of the bear in nature because they are very shy and rare. They are not aggressive at all and always avoid contacts with humans, only same exemplars began particular confident and move to the villages to eat food and fruit but the park rangers work to discourage those behaviours�. 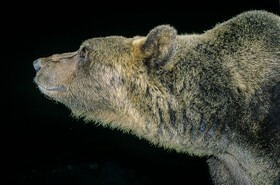 What is the best season to photography the Apennine bear? Why? 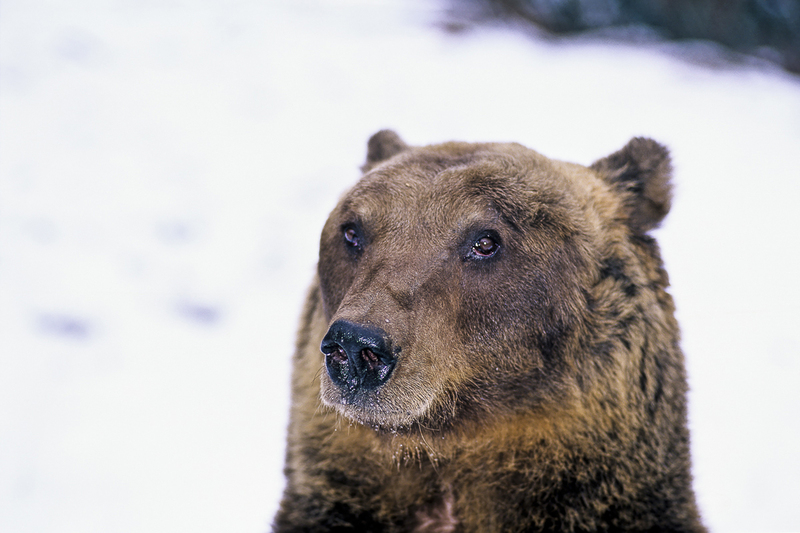 �The best season to see bears is between the end of summer and the start of autumn, when, before the beginning of hibernation, the bears hum with activity to prepare themselves for the winter by eating large amounts of food and storing energy in fat deposits. 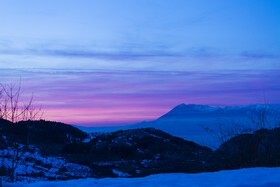 This also a great season to visit the PNALM (Abruzzo, Lazio and Molise National Park). 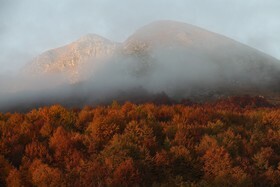 At this time of the year the beech forest gives us the warmest most vibrant colours and the autumn light illuminates the rock of the mountains creating a magic atmosphere. . . What we can suggest to photographers that will came and visit PNALM to see the bears is to rely on expert and qualified guides. We are first of all conservation photographers and in our working we act with few but essential principles, first of all is avoid causing damages: damages to the animals subject of your reportage, damages to the fragile habitats that host us during our work�. 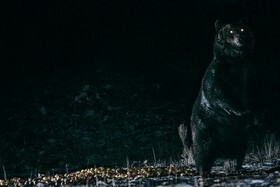 What is your way of tracking bears (do you look for feces, footprints, caves�)? �To tracking bears we use most of all the experience: experience of rangers and our experience, that, year after year, we accumulated working on the field. The knowledge of the territory and the habits of wild animal is fundamental for succeed in wildlife photography in general. All the marks left by animal are important to track him, the hairs left on scratchers, the food remains and the droppings are 3 of the most important aspects to be monitored in order to have any chance of seeing bears in the wild. In particularly during our collaboration with the Park and the University we used the radio tracking. Radio telemetry allows us to follow bears at a distance, giving the opportunity to study their movements and the areas that they most frequent�. On the field, how do you operate with Alberto Cambone? Does each of you work alone or do you go on the field together to take pictures? �I work with Alberto from the very beginning of my career, we work together on the field and we collaborate for each shoot of our reportage. Before to go to the filed we plan carefully our work, studying the species and the territory we are going to narrate, working as a team allow us to multiple the point of view and to realize on the field, more easily, some elaborate techniques�. What camera equipment do you use? What are your focal preferences? �Now we are using Canon EOS digital equipment, but some of the shots of this work were taken by analogic cameras (always Canon). We really like find unusual angles of view for our photos, so we often use super wide-angle lens to take portraits, or super-tele lens to take landscapes details�. 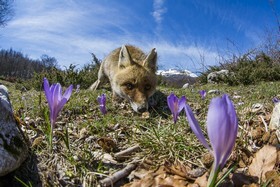 Abruzzo is a region increasingly rated by wildlife photographers. Have you noticed increased pressure on animals lately? 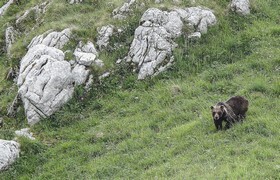 �The main problem for wild animals and the first cause of extinction risk for Apennine Brown Bear is the human pressure on the habitat (above all cutting of forests, use of land by breeders, and poachers). However the recent increase of tourists, hikers and photographers gives its contribute to this phenomena. To reduce these kind of human pressure the park put a cap on the number of daily visitors in the more sensitive areas, on seasonal base�. Do you organize shooting workshops? 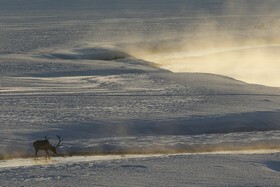 �Yes, we do, even if we prefer dedicate most part of the year to field photography and expeditions. Because of we really believe that teaching is an important activity to which dedicate maximum energy and attention, we never mix up our photographic activity with our teaching activity. We like above all to teach �en plen air� and lead people in the wild, in this occasion we try also to transmit respect for animals and environment�. If you do so, what do you teach to trainers? �What we try to do is to give a vision: a vision of photography, a vision of the relationship that should be created with subject and tell photographers to look for their vision. Then we try to communicate our �Three C� method: Conservation; Creativity and Communication. Also technique is important and we try to share with the attenders of our workshop the long experiences of 25 years of work on the field�. What tips do you give them? �It depends on where the workshops take place and on what it is focalized. Some good generic tips can be: � �Planning is important, being creative does not mean improvise, before beginning fieldwork collect deep information about places and specie that you're going to photograph, a good reportage requires, not only special images with unique angle, but also to document the peculiarity of the species during the different seasons and in different situations. � �First of all don�t harm, don�t harm wildlife, don�t harm environment,. In other words try to minimize your footprint in work�. Can you explain the purpose of Homo ambiens? 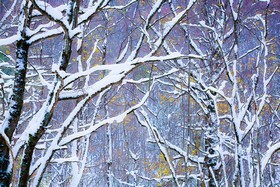 Do you consider yourself as a naturalist or as a photographer? �When we create a photographic work, we want a results that combines four qualities: innovative photographic technique, creativity, communicative skill and high documentation value. In our vision Homo ambiens is environmental man, the next step after Homo sapiens. When more than 20 years ago, We turned our young passion for photography into a profession, we had little stuff, a great enthusiasm and the confidence that, wherever this big adventure would have bring us, one thing would never change: our love for natural world. And this is what still today drives every day our work and our photography. We strongly believe that photography can give a great support to conservation scientific research, environmental documentation, and raise consciousness on priority ecological themes�. Do you really think that picture can influence people's behavior towards the environment? �Yes, I really do. For me photography represents the perfect way to describe the natural world surrounding us and, at the same time, the best manner of showing the emotions that this evokes. I try to lead my audience, to a new and clearer vision of a critical issue, catching their interest and stimulating their curiosity. Our work developed several photo stories used by the main environmental Organizations (ARKive, WWF International and Italy, Greenpeace, Lipu -Birdlife Italian represented, Survival, Our Places - UNESCO) to promote some of their campaigns�.